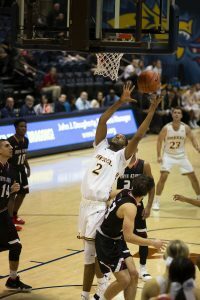 The Drexel University men’s basketball team started their season on the road as they traveled to Ypsilanti, Michigan, to play Eastern Michigan University of the Mid-American Conference Nov. 9. The first half of the game was a seesaw battle, as Drexel was able to keep up with a surprisingly strong Eastern Michigan team. Drexel had a lot of success beyond the arc in the first half hitting seven three-pointers, which accounted for 21 of their 28 total points. Drexel was led by graduate student Trevor John, who shined in his first game as a Dragon. John scored 19 points in his debut, going six for 17 from deep. In the second half, the Dragons found themselves in a 12-point hole against Eastern Michigan thanks to Eagles senior Paul Jackson. Jackson showed incredible energy after halftime, scoring 11 of his team’s first 20 points of the half. Jackson led all scorers with 20 points to go along with six assists and four rebounds. Drexel showed some resilience, fighting back to tie the game at 62 after a John three-pointer with one minute remaining. Unfortunately, that was the last time the Dragons would score, as EMU’s junior Boubacar Toure sealed the win by scoring the final four points of the game. Despite the loss the Dragons played very well as a team statistically. The Dragons shot 13-34 from three, going 38 percent from beyond the arc. They also had 17 assists as a team, displaying the ability to move the ball and find open shooters. Junior Kurk Lee performed well for the Dragons scoring 13 points, including shooting 4-7 from three to go along with four assists, four rebounds and two steals. The Dragons next game in the Hub City classic was against Rutgers University Nov. 11. Drexel was able to keep up with the Scarlet Knights, and only trailed by seven points at halftime. The Rutgers team was led by sophomore Geo Baker, who had 15 points in the first half. Despite this, the Dragons trailed by only three points after one minute into the second half. Unfortunately, the Dragons were unable to keep up with Rutgers for the rest of the game. Midway through the second half the Scarlet Knights went on a 33-5 run until around the five minute mark. Drexel could not contain junior Eugene Omoruyi who finished the game with 24 points, including four three-pointers to go along with 10 rebounds. Lee had a good showing for the Dragons hitting four three-pointers in six attempts for the second consecutive game. The Dragons struggled defending the three as they allowed Rutgers to shoot 53 percent hitting 14-26 attempts. The Dragons had their first home game of the year as they hosted Bryn Athyn College, a Division III school Nov. 14. The Dragons dominated this matchup. Drexel was led by John who hit eight three-pointers. Junior Zach Walton was also impressive with 15 points. The Dragons defeated Bryn Athyn with a score of 118-41. This is a new record for the most points scored during a game and for the most points scored during regulation time, beating the previous records of 115 and 109 points, respectively. Drexel’s next game will be Nov. 17 with an away game against La Salle University. Then they travel to Ohio Nov. 18 to play Bowling Green State University. This should be a great game to look forward to, especially with all the momentum the Dragons have coming off that large win.